MetOp (Meteorological Operational) satellites are polar-orbiting weather satellites, three of which are planned as part of the Eumetsat Polar System (EPS) program. They will carry instruments provided by ESA (European Space Agency), Eumetsat (European Meteorological Satellite Organisation), NOAA (National Oceanic and Atmospheric Administration), and CNES (the French space agency), with the aim of improving upon the established service provided by NOAA satellites. 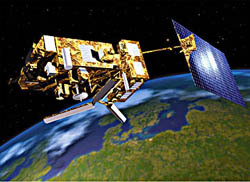 MetOp A, the first in the series, was launched in 2006.